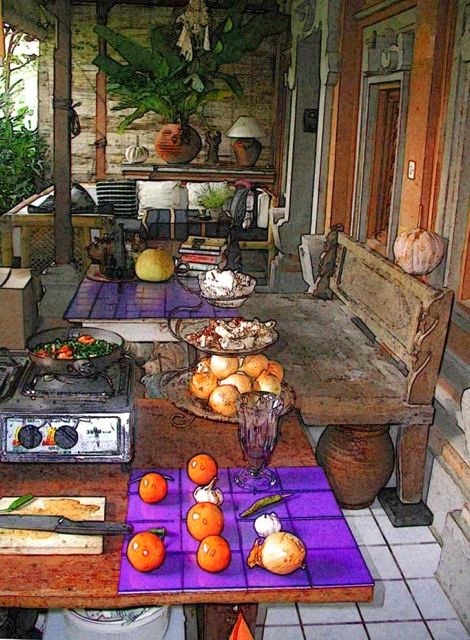 This is right where I would like to be cooking and eating nasi goreng – in my friend Victoria’s open air kitchen on her front verandah in Ubud, Bali. 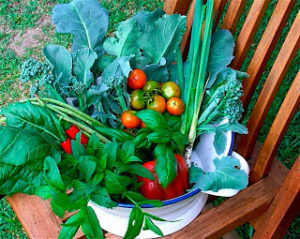 Victoria is a marvellous gardener and cook (she is also very clever with photoshop!). You will find this Chinese inspired dish all over Indonesia, with regional variations, and for many people, me included, it is real comfort food. I could eat it for breakfast lunch and dinner in fact, when I come to think of it, I probably have! I make it all the time – it’s a very nutritious and simple way to use up yesterday’s cooked rice just by adding a few simple ingredients. You can make it with whatever you have to hand, but it is usually made with the inclusion of a little chicken, a few prawns, tofu – or simply vegetarian. 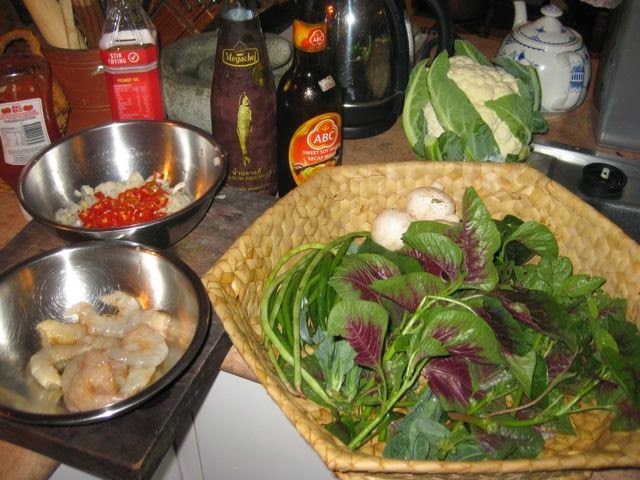 Today I am making it with green prawns. This will feed 3-4. 2-3 cups finely shredded greens. I am using kale and amaranth from the garden (bayam) and a few snake beans, plus some finely chopped cauliflower and a couple of mushrooms – because that is what I had! You could use any Asian greens or cabbage. Oh, I also had some cooked corn which I used. 1 tbsp tomato ketchup – this is the secret ingredient and differentiates Indonesian fried rice from Chinese. 1 egg per person, lightly beaten with a few drops of sesame oil. NOTE: Nasi goreng is traditionally served with a fried egg on top – particularly for breakfast, but when you are making it for a few people I like to include the cooked eggs in the finished dish. Method Nasi goreng is very quick to make – the time is taken in the preparation – a few, cheap metal mixing bowls really help! 1. Beat the eggs together with the sesame oil. Heat your wok with a little of the peanut oil and quickly cook the egg – flipping it over so it gets a little brown on both sides – don’t overcook. Tip back into the bowl you beat them in to add at the end. 2. Put chopped onion, garlic and chilli in a small bowl. 3. Have all your other shredded vegetables in a separate bowl. 4. 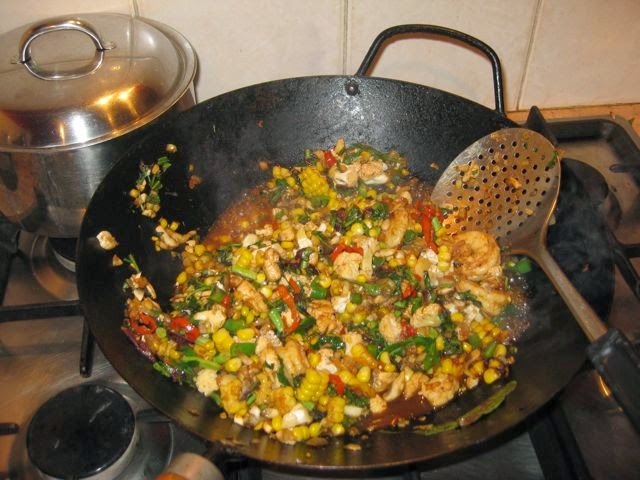 Wash out and dry your wok (important it has no egg residue on it), add remaining oil and heat. 5. 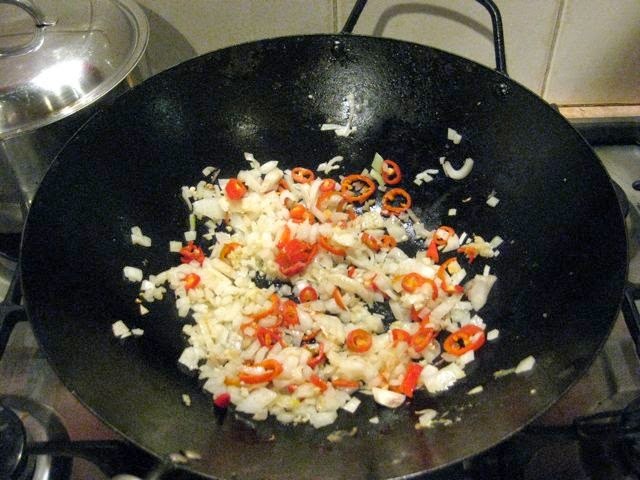 Add onion, garlic and chilli to wok and stir fry for one minute. 6. Add prawns (chicken, tofu etc) and toss on high heat for another minute. 7. Add the bowl of shredded vegetables with the kecap manis, fish sauce and tomato ketchup. 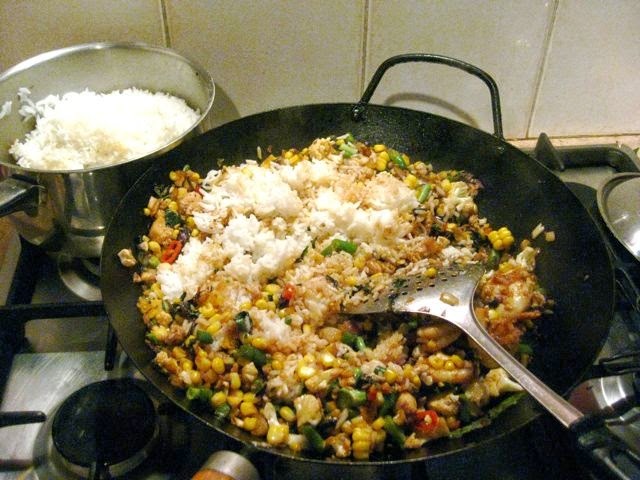 The liquid will quickly evaporate – this should not be a ‘wet’ dish or your rice will go gluggy! Toss for another minute. 8. Add the rice and stir through. Toss for another minute. 9. Now it’s done – about 4 minutes. All you have to do is stir through the finely sliced egg and garnish with some fried shallots (you can buy them in a packet from Asian stores). 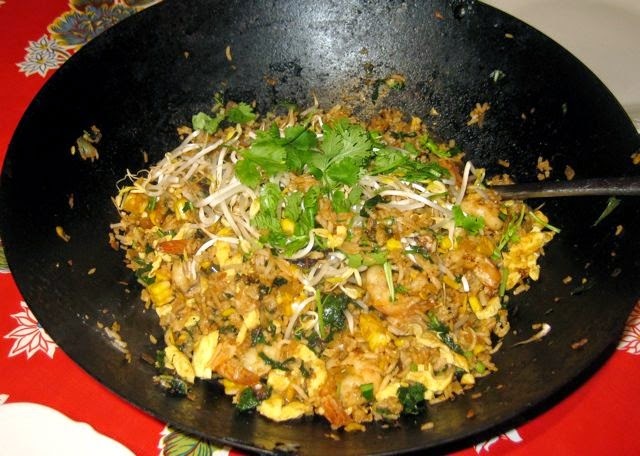 TOP TIPS FOR MAKING SUCCESSFUL Nasi Goreng. I used to be useless at making this, what is essentially, a very easy dish – that is until my daughter’s friend, Anton, came to stay from Java, Indonesia. He would make this every morning for breakfast and I would watch with interest and then eat the leftovers! NOTE: I have just discovered a local, long grain, rain-fed brown rice that makes perfect fried rice. 2. It’s best to use rice that is a day old and not overcooked. NOTE: There have been recent press reports about the health hazards of keeping cooked rice. This only applies to rice that has not been refrigerated. 3. Have all your ingredients pre-prepared so that you can make it quickly. 4. Use kecap manis and not ordinary soy sauce. 5. Anton’s secret ingredient (and famous Indonesian cook Janet de Neefe’s) tomato ketchup! 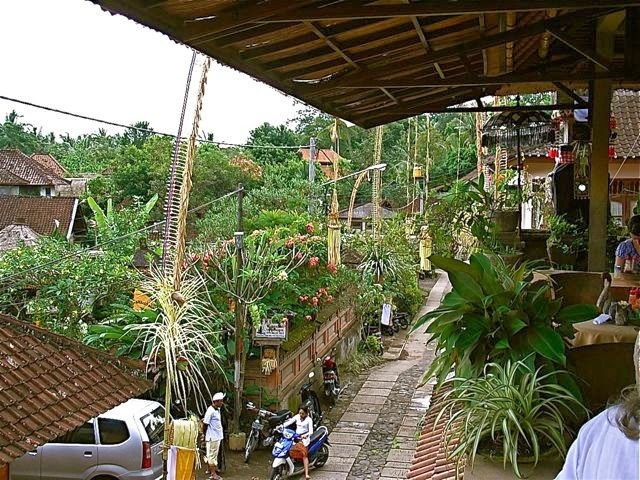 The backstreets of Ubud where I have spent many happy hours eating nasi goreng!